MAN is currently introducing the new generation of advanced emergency braking system with sensor fusion (EBA emergency brake assist) and the emergency stop signal (ESS). At the same time the EBA and also the new lane guard system (LGS) are becoming standard accessories in those vehicle models to which mandatory equipment requirements apply for new registrations from November onwards. This includes the vast majority of MAN trucks, both MAN and NEOPLAN coaches and intercity buses, and also MAN coach chassis. Even in 2014 every second MAN TGX sold in Germany already included the Active or Active Plus safety package and was equipped with the EBA advanced emergency braking system - and the trend was upwards. 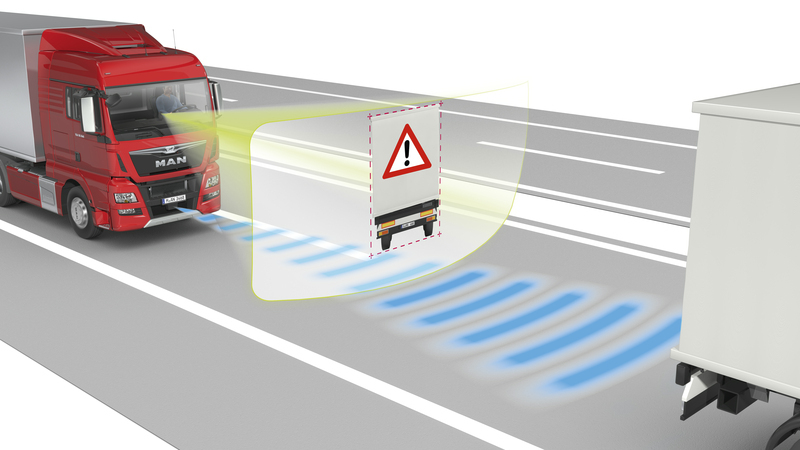 Heinz-Jürgen Löw, Sales & Marketing Chair at MAN Truck & Bus, explains: "This trend confirms our commitment to active safety and MAN's next step towards a rapid spread of our safety systems: from July the new generation of advanced emergency braking system and lane guard assistant will be standard in virtually all truck and coach models. Our customers are thus given a comprehensive range of safety features and consequently a very high level of active safety. MAN's new EBA advanced emergency braking system even now delivers braking performance considerably better than that which will be required by law in 2018. EC legislation requires the following vehicle categories to be fitted with a Level 1 emergency braking system from November 2015: Newly registered trucks with two or three axles, a gross vehicle weight over 8,000 kg and an air-sprung rear axle. Also mandatory is a lane guard system for two- and three-axle trucks over 3,500 kg. The EBA emergency braking system to be fitted by MAN from July 2015 onwards even now easily satisfies the stricter legal requirements for Level 2 which come into force in November 2018 for newly registered vehicles. This means that today's customer purchases a high-value and future-proof system. Stationary objects are distinctly harder to recognise with certainty than vehicles in front. In this respect, the system must distinguish relevant objects (such as a broken-down vehicle or a stationary vehicle at the tail-end of a traffic jam) from irrelevant objects (road signs, tunnel entrances, bridges). In order to prevent an emergency braking being carried out in error, the emergency braking assistant does not react until the situation is with a very high degree of probability correctly interpreted. The system makes a more intensive and therefore longer analysis in order to make absolutely sure that there really is a stationary obstruction in the lane ahead. MAN possesses significant competence in researching vehicle operation concepts in commercial vehicles. Scientific observation of drivers in the driving simulator at the Technical University of Munich yielded important findings for the interpretation of the warning and reaction behaviour of the EBA system, for example, regarding driver attentiveness and distraction, as well as stress and behaviour in emergency situations. The design of the EBA emergency braking system follows the principle that "the driver should always be in control". This MAN-specific warning philosophy ensures a high level of driver acceptance. The interaction of two technologies - radar and camera - reduces the risk of unjustified warnings significantly since two technologies can be used for object recognition. MAN thus achieves its aim of bothering the driver as little as possible with warning signals. Following his own assessment of the situation the driver can overrule the emergency braking system when there is a warning or even when emergency braking is already in progress. Here he can use the accelerator or brake or operate the indicator to start changing lanes and in this way cancel the warning or abort automatic braking. When there is no further risk of collision, for example, when a slow-moving vehicle has moved onto the hard shoulder, the EBA cancels the emergency braking procedure. The new Lane Guard System (LGS) uses the latest camera technology. This makes for greater accuracy in lane detection and a minimum of unjustified warnings. At speeds above 60 km/h the LGS monitors the vehicle's position with respect to the lane and warns the driver should he accidentally cross the lane markings. Additional functions improve the driver's comfort. The new system detects autonomously when lane conditions change: a reliable warning is only possible when right-hand and left-hand lane markings are present and the lane exceeds a minimum width. The new LGS also takes into account the fact that many drivers for the sake of safety like to drive on the outside of the lane - that is, at the right edge in countries which drive on the right - and for this side of the lane gives a warning later. The system also adjusts automatically to whether the country drives on the left or on the right. The driver can thus enjoy the pleasure of an adaptive warning philosophy. You can download the footage for editorial purposes via the MAN Image Database.